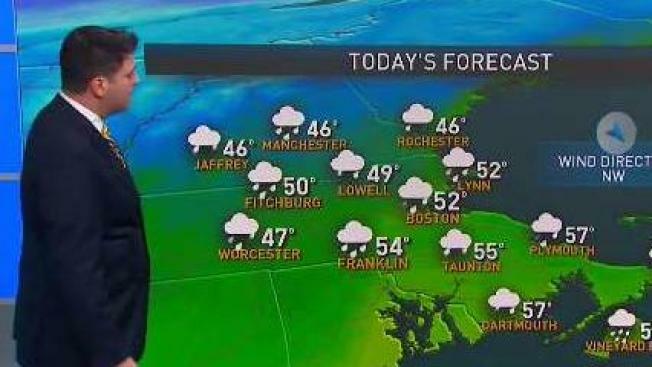 Rain central and east, highs near 50. Overnight Wednesday: Clear with a cold wind, lows in the 20s. It’s one of, if not, the biggest travel days of the year, and we’re tracking a period of developing rain, which will last longest in southeastern New England. It won't drop more than scattered rain and high terrain snow showers in Western New England, but a steady rain from morning to midday in Worcester, wrapping up during early afternoon in Boston and mid to late afternoon on Cape Cod. So, make sure to pack the patience and be ready to use the wind shield wipers for your travels across New England. However, if you’re flying to your destination, across most of the continental United States looks dry and mostly sunny. If you’re heading to Chicago, it will be much cooler than here with highs into the mid to upper 30s Wednesday. If you’re travel plans take to you the west coast, southern California looks nice and warm with highs into the 80s. Flying to the Pacific Northwest, take the umbrella with you, showers are expected there. If you are sticking around New England for the holiday, drier and cool air blows into New England, locking in sunshine for Thanksgiving Day for great local travel conditions with highs in the 40s and a repeat performance on Friday. Continuing in our pattern of ups and downs, Saturday will bring temperatures back into the 50s ahead of some evening showers with a passing cold front, then drier and cooler air sets in for a couple of days Sunday into the start of next week... before our next moderation in the exclusive 10-day Early Warning Weather Forecast.